There are a few big names in the industry when it comes to interactive gaming, and they’ve held the title for years. The two main factions tend to fall into either Microsoft – with their X-Box incarnations – and Sony – with their likewise Playstation legacy. But Sony has returned again, and this time they’re trying to keep pace with both current technology and the demand for better and higher quality gaming experiences. So what’s left? In a word, virtual reality. Virtual reality has become the new frontier in terms of visual entertainment, whether in the form of movies or, more famously, in games. As a result, Playstation has managed to craft their own specialized device, aptly titled the Playstation VR (alas, no points for creativity). And there are a few things that have really put Playstation VR in the eye of the public in terms of what they’re offering that is completely new and novel. One of these has to do with the fact that the headset manages to display two sets of images – one is exclusive to the user of the headset, who is able to control what they see in a 360 environment, but the other is routed back to a TV that allows others to see what the user is seeing. To date, this has been something that hasn’t really bridged the gap between VR devices and an audience, and there is definitely something appealing about being able to have others see what you’re seeing and have them interact with you (Look left, look left! – well, backseat gaming has always been a problem). The system, called Project Morpheus, is essentially a social form of virtual reality which as mentioned, allows not only the user to partake in the 3D adventure, but also opens it up for other spectators. As a result, there is a lot of excitement about some of the potential applications of this. With your Playstation 4 (or any console) a huge element of gaming has always been the integration and cooperation that is afforded by a social experience, and it seems as if Project Morpheus is taking that to heart. The system will also be able to incorporate a variety of special features, including the possibility of more devs and multi-platform use, as well as the ability to snap screenshots within the game. Fans of the Playstation are already commenting on how it is essentially bridging the gap between VR and other 2D based console games, and therein lies the element that may make Project Morpheus succeed where other technological fads liked 3D TV failed: with virtual reality, there is literally another universe to explore in terms of what it possible with the technology, whether it’s in the form of first person RPGs, shooters, or even sports games. It is also conceivable that when the technology takes off, we might see some classic PS4 titles redone in VR? 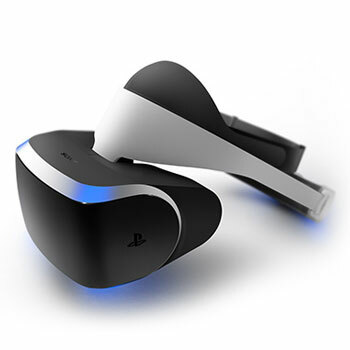 Probably the most attractive thing about Project Morpheus and the Playstation VR – other than its technical specifications which we’ll get to in a moment – is its adherence to an age-old philosophy that has hallmarked the company since the beginning. It has every intention of making the headset and VR system available at a consumer based price. This is huge news, considering the fact that a number of the top-tier VR headsets such as the Oculus Rift and the Vive from Steam are all extremely expensive (anywhere from $700 CAD and up). By offering a device that is consistent and compatible with pre-existing platforms, Playstation is also making Project Morpheus one of the most accessible in terms of an interested and eager demographic. The quality of the headset is again extremely promising, equipped with a 5.7 inch 1920 x RGB x 1080 resolution OLED display that ultimately extends the field of view and enables a low persistence by removing motion blur. They also have positional tracking with 9 LEDS and are hoping to offer a uniquely immersive sound environment which will actually be 360 degrees, and we’re quite excited to see that they’re putting just as much emphasis on aural sensory as they are visual. There is also going to be a haptic-based control system as well, with the use of external wireless controllers that will allow you to physically immerse yourself in the game as well (and as per their flair, Sony’s controllers of course come with a glowing light on the end). On top of this, they also have, as far as we know, the highest refresh rate of any VR headset, promising 120 Hertz, well above the 90 Hertz of some other models. Lastly, they seem to be learning a lesson from previous VR devices and are hoping to offer a super low latency (less than 18ms) – this is almost half of what their first Playstation VR system had, by way of comparison. And of course the Adult Industry has already found a new market with the PS VR. It was pointed out that while virtual reality might be the new frontier when it comes to games, that frontier can only really be pressed and explored and truly apprehended unless there is more than one company making that move. In terms of technological revolution, competition is often the master method by which we see an industry sprawl – and for VR in particular, this bodes especially true. With other studios and producers like Oculus and HTC also aiming for the stars (sometimes literally, with a huge number of space based VR sims seemingly in the works). While the actual mass-market accessibility to Sony’s Project Morpheus may still be several months or years in the future, I think we can expect a lot from their system: in terms of graphics and social immersion they’ve already demonstrated their commitment to delivering a product that will be in line with their previous devices like the PS4, but being able to offer that same experience at affordability is definitely what makes them stand out. As mentioned, both Sony and Microsoft have also been extremely loyal to their fan base, and I don’t think it’s entirely unreasonable to hope for a possible reboot of classic titles we’ve all come to love being remastered in VR with Project Morpheus.